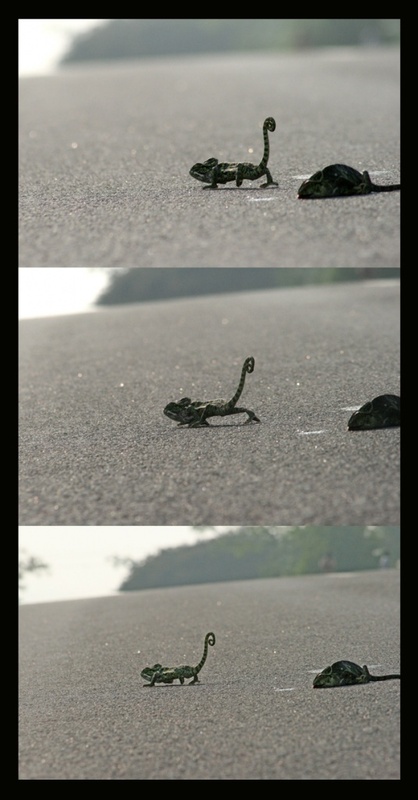 We parked the car off the road and I rushed towards the chameleons with my camera. Contrary to my earlier apprehension, only one of them was killed while the other one was still alive. It lay still without much movement. I can’t explain why it chose to stay in the same place without thinking of escape. Both appeared to be full grown chameleons. I don’t know how they were related to each other. Brothers? Sisters? Friends? Mates? Whatever it may be, the live one was vulnerable to being run down by passing vehicles. Did it understand that threat? Was that why it was afraid to move from there? Or was it paranoid of moving ahead after seeing what had happened to the fellow traveller? Or was it too shocked to take the next step after seeing its companion’s fate? Or was it mourning over its partner’s death and didn’t want to part from it? Or it was still waiting for the other one to get up and walk along with it? Which of the emotions ruled the chameleon’s mind at that moment, I don’t know. But all I could see was that it was not moving from there. While still taking pictures, I slowly approached them. It probably noticed my movement towards them and slowly turned away from the dead one. It seemed in a confused state of mind and couldn’t figure out which direction to go. Finally, it decided to cross the remaining few metres of the unfinished journey alone. As it moved away towards the other side of the road, it’s turned blacker and there was very less green or yellow. Anger or Sadness? 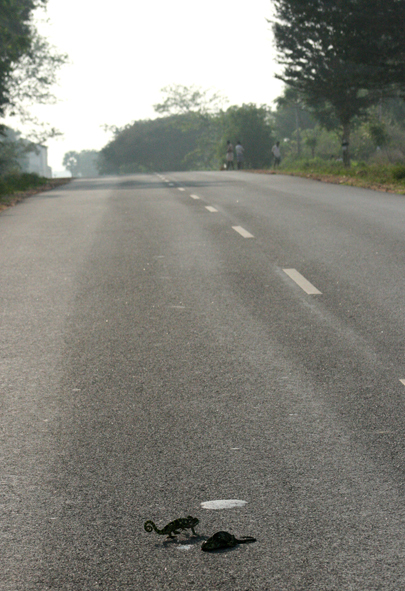 Though it moved, it was not fast enough to escape from the heavy rubber tyres passing every minute. Fearing another casualty, I tried to pick it up by its curled tail. As I touched its tail, it turned around and looked at me with its red mouth wide open and threatened me. It was as if to say ‘oh you human being, don’t you dare touch me’. I moved back. Just stood there and watched it go, only this time at a quicker pace. I looked at the dead chameleon for the last time and picked it up and put it in the bushes at the side of the road. I looked at either side of the highway. There were hillocks adorned with beautiful Umbrella thorn trees Acacia planifrons, thus indicating similar habitats on either side. I don’t know what then led those two chameleons to cross the road. Only they know what their need was and what they will get on the other side.